Trump is very unpopular in Europe. 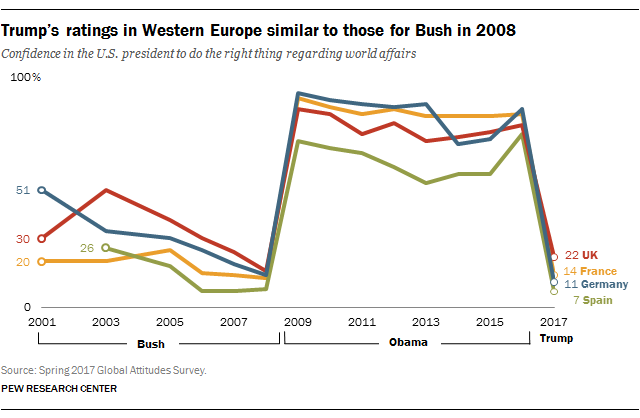 Last year he was at the level of Bush Jr. at the end of 2nd term and with this European tour he has probably gone even deeper in public opinion. As we can see with his pro-Boris Johnson comments Trump is clearly supporting hard Brexit and all the populists anti-UE politicians in Europe. He views the UE as a foe and seems more interested in getting more money from Europe than in keeping an alliance. From a UE point of view Trump is more toxic than Putin. Trump calls the European Union a “foe.” The German foreign minister then says “We can no longer rely on the White House.” This means that it is an alliance bankrupt? Fresh from calling the EU a “for,” President Trump tells Putin that they should discuss their “mutual friend” President Xi of China. G7 is dying? So, the new G3? As to the comments and complaints that Germany does not trade fairly, I would have to disagree. Trade between countries of equivalent levels of development and equivalent internal cost structures is inherently fair trade. The players are all starting from a costing structure that is roughly equivalent and thus the benefits of trade come from longer production runs and inherent local advantages It is the politicians that then carve out special exemptions to support local inefficient, but highly vocal, blocs that start to cause the problems. The US has the ability to produce pork and beef at a much lower cost profile than Europe. To export meats to say Italy and import Italian leather furniture increases the values to consumers in both countries. To sell grain to Germany and import BMWs is a fine exchange in value. Both countries have educated populations and health-care costs and worker compensations that put them on a roughly equal footing, so the ideas of comparative advantage so loved by Milton Friedman actually do work. I have no problem buying my sofa from Italy (and I did) and no problem buying my BMW from Germany (I did) and I have sold my manufactured goods to Germany in exchange, and I am the richer for it (and so are the Germans). You want to keep that in mind when referencing trade inside the West. Yup, George really sank, due mostly to appallingly poor advice from incompetent advisers. As for The Donald, well, he really doesn't need any help from anybody, he is quite capable of sinking all on his own. Oh, well. Good one - candidate for joke of the week. The Euro is deflated by the presence of several debtor countries (PIGS) which allows Germany to compete with a currency of far lower value than the deuchmark if it existed today. Via its foreign policy arm - the EUSSR it applies no end of environmental restrictions on other countries so while the UK has been dutifully shutting down its coal fired power stations Germany has been opening lots of new lignite fired ones which it then uses to dump loads of surplus power on other grids causing further contraction of other countries electrical generation infrastructure. It has been heavily reliant on defence welfare from the USA and to some extent the UK for decades. USA pays 3.6%, UK 2.1% and Germany pays 1.2%. Trumps quite right, Germany is rich so this is not acceptable. So now Germany can start paying its fair share (NATO) and a light has been shone on their barriers to US auto sales. Sounds like Trump is winning to me. The EU is finished. Stick a fork in it. Hum... After the Helsinki Press Conference the winner seems to be ... Vladimir Putin. The EU is not finished. What is really finished now is European confidence in the US. While Trump was showing his love to Putin in Finland, there was a EU-China summit in China. Given the erratic trumpian policy, it seems that on many matters the EU is now closer to China than to the US (climate change, trade, Iran deal...).